June | 2017 | You can't evict a Movement – You can`t evict Solidarity! Am vergangenen Donnerstag, den 22.06.17, fand in Thessaloniki ein weiterer Prozesstag gegen die über 50 angeklagten Besetzer*innen des Hurriya statt. Der Prozess wurde ein weiteres Mal verschoben, diesmal auf den 8.11.2017. This entry was posted in General, Griechenland, Hausbesetzung, Hurriya, Prozess, Repression, Solidarität, Thessaloniki and tagged 2017, Griechenland, Hausbesetzung, Hurriya, Prozess, Repression, Solidarität, Squat, Thessaloniki on 2017/06/25 by can't evict solidarity. 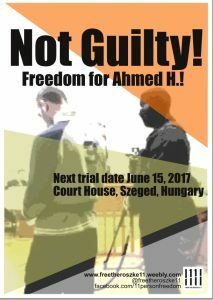 [Röszke11] Trial of Ahmed H. To Be Retried! Trial of Ahmed H. of Röszke 11 To Be Retried!!! Ahmed H’s case will be retried, but he remains in prison. Ahmed is one of the Röszke 11 and is in prison for 2 years now. Yesterday afternoon, the appeal court of Ahmad H. was held in Szeged (Hungary) . The court finally concluded that although the first instance court had the right to refuse available evidence, it did not analyse it enough and did not sufficiently explain why such evidence was refused. Relevant facts were established, evidence was presented, but the decision lacked proper reasoning and deliberation. Thus, the verdict was not consistent and objective. Moreover, the first instance court should have analysed whether throwing stones was indeed an attempt to force a state organ, or just an act of losing self control – the latter would have meant that the terrorism charge was not valid. Additionally, there seemed to be confusion in the police report on how much time was given as an “ultimatum” and who gave it in the first place. This entry was posted in Ahmed H., General, Prozess, Röszke11, Repression, Solidarität, Ungarn, Urteil and tagged 2017, Ahmed H., Grenze, Prozess, Röszke, Röszke11, Repression, Solidarität, Szeged, Ungarn on 2017/06/16 by can't evict solidarity. During the last month we witnessed the state escalating its anti-immigration policy of restrictions against refugees and the solidarity movement. In Addition to the EU management of migration issues which include forcing people to live in horrible conditions ,deporting them and denying them their basic human rights, the Greek government is revealing its totalitarian face by demonstrating its repression power through evicting political and housing squats for refugees. In the last days new information was leaked through newspapers, about court decisions focusing on the eviction of three more squats. Papoutsadiko, Zoodoxou Pigis 119 and City Plaza, one of the largest refugee squats that host around 400 people. It is clear that the state is focusing in shutting down every self organized free space, including all housing squats for refugees. 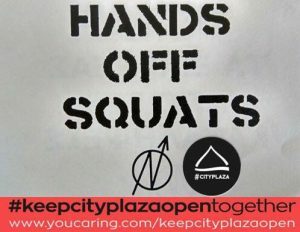 An attack towards City Plaza or any squat is an attack to all of us. They know how to use the power of riot police forces, but we know how to use the power of solidarity! As long as they try to evict the squats, as long as they build camps and detention centers, as long as there are borders – we will also be there to fight back and fight for a better world! We won’t bend down, we won’t let them in, we stand united! We will show them again what we already proved, we live together, we struggle and we resist together – to defend the dignity of each individual, to defend our principles of solidarity and to keep our free spaces open. Therefore we call for a protest and a gathering on the 23rd of June, in front of the Ministry of Migration (Stadiou 27) at 7 pm. On the same day we call for an International Action of solidarity towards all squats and against evictions! Close the camps and detention centers! Cancel the shameful EU-Turkey deal! This entry was posted in Athen, Deutschland, General, Griechenland, Hausbesetzung, Protest, Repression, Solidarität and tagged 2017, Athen, CityPlaza, Griechenland, Hausbesetzung, Protest, Repression, Solidarität, Squat on 2017/06/16 by can't evict solidarity. Über die letzten 14 Monate, ist das City Plaza, ebenso wie all die anderen Besetzungen zur Geflüchteten Unterbringung, ein Störfaktor im öffentlichen Raum, gegen eine Kulisse der konstanten Wiederholungen repressiver und rassistischer Diskurse gegen Geflüchtete. Denn das City Plaza hat nicht nur bewiesen, dass Geflüchtete und Anwohner*innen harmonisch und in Würde miteinander leben können. Es zeigt auch, gemeinsam mit anderen, ähnlichen Initiativen, dass da auch ein anderes Europa ist, dass anders ist als das Europa der Euro-Gruppe und Frontex. Ein Europa der Solidarität, des Widerstands, der Menchlichkeit. Und genau das ist es, was für die Machthaber*innen eine Störung darstellt. Wir werden keine Angst haben, wir werden uns nicht beugen, wir werden nicht klein bei geben. This entry was posted in Athen, General, Griechenland, Hausbesetzung, Protest, Repression, Solidarität and tagged 2017, Athen, CityPlaza, Griechenland, Hausbesetzung, Protest, Repression, Solidarität, Squat on 2017/06/08 by can't evict solidarity. [Thessaloniki] Rettet das Social Centre – Immigrants Place (Steki) in Thessaloniki! Wir als “You cant evict Solidarity”-Kampagne unterstützen finanziell das Social Center – Immigrants Place STEKI in Thessaloniki. This entry was posted in General, Griechenland, Repression, Solidarität, Thessaloniki and tagged 2017, Griechenland, Repression, Social Center, Solidarität, Steki, Thessaloniki on 2017/06/05 by can't evict solidarity.